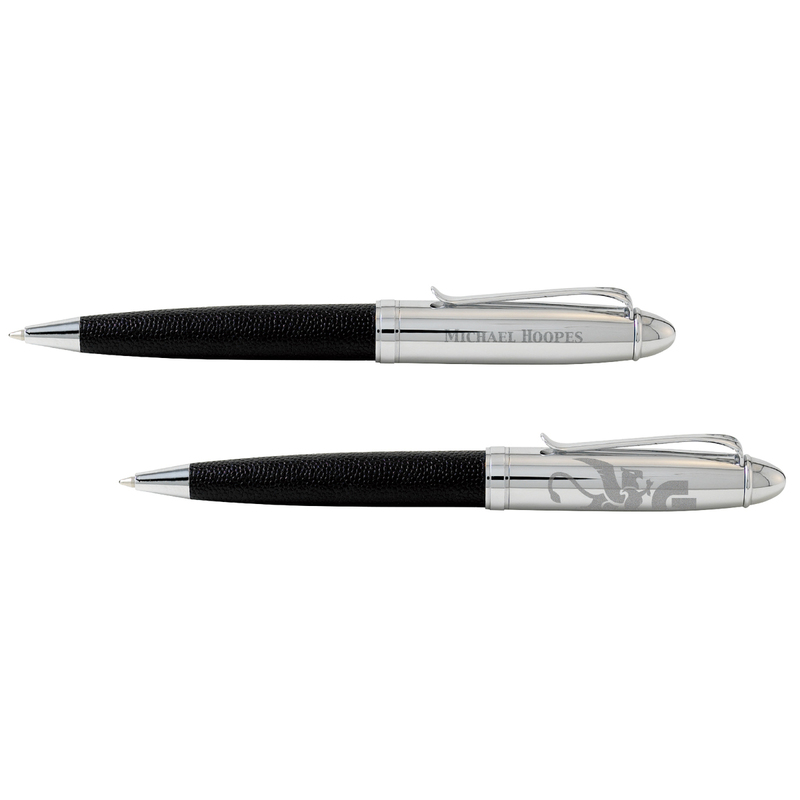 A stylish twist-style refillable ballpoint with leather barrel and polished chrome plated trim. Velvet lined two-piece black gift box included. FREE set-up. Fine leather barrel and polished chrome-plated trim. Refillable. Two-piece black gift box with velvet lining included. Mechanism: Twist-Action. Price includes 1 line of repeating copy or personalization on cap. Laser Engrave Set-Up, No Charge $.00 (Z) per order. 330 Degree Laser Engrave Set-Up $50.00 (G) per order. 330 Degree Laser Engrave Run Charge $.60 (G) per piece. Laser Engrave Personalization $.60 (G) per piece. PhotoFast Emblems Set-Up $18.00 (G) per order. PhotoFast Emblems: Clip $2.50 (G) each. Packaging: Black Two-Piece Gift Box with Velvet Lining.